Find hotel near Moana Adventure Tours - V .. The word 'Moana' literally means 'sea' in Tahitian. Operated by Phillipe, Moana adventure tours has been arranging excursion on the islands for last years. Boasting variety of adventure tours, they also tailor personalised tours according to the needs of the visitors. The well-trained guides add to the adventure experience! Snorkelling excursions; including shark and ray snorkel safaris. Private lagoon tours with a picnic on a beautiful motu. Fishing expeditions; in the lagoon on light tackles, or trolling outside the reef. Circle Island Road tour around the perimeter of Bora Bora. Airport transfers can be arranged. For detailed schedule of various tours, check official website . For detailed schedule of various tours, check official website. Love this? Explore the entire list of places to visit in Bora Bora before you plan your trip. Fancy a good night's sleep after a tiring day? Check out where to stay in Bora Bora and book an accommodation of your choice. Try the best online travel planner to plan your travel itinerary! How popular is Moana Adventure Tours - Vaitape? People normally club together Leopard Rays Trench and Maohi Nui while planning their visit to Moana Adventure Tours - Vaitape. 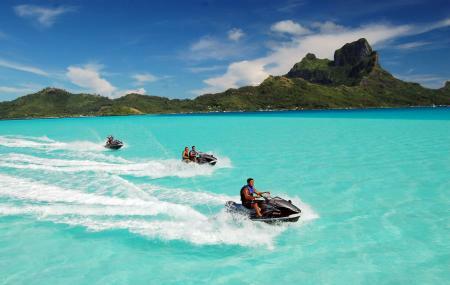 We booked a jet ski tour through Moana Adventure Tours and had such a great time. Our guides Jean and Marden were gracious, funny, and knowledgeable about Bora Bora's history and culture. They stopped us along the tour to show us spotted eagle rays, sting rays dolphins, and other points of interest. You can tell how proud they are of their culture and their home and it made the tour unforgettable. We booked a snorkeling tour and a jet skiing tour. Both were AMAZING! The norkeling included swimming with sharks and manta rays. This was one of the best experiences of my life. Our guide was fantastic, unfortunately I don't remember his name. He cooked us an amazing Tahitian BBQ lunch. Our jet ski tour around the island was also a magical experience. Tellira was an amazing guide and made sure we were enjoying our time and kept us safe. He was very friendly and knowledgeable about the island. I highly recommend Moana Adventures, they were extremely professional and everyone was very nice. Mauruuru! We did the Bora Bora Snorkel Cruise with Shark and Stingray Feeding Tour and it was one of the best excursions I have booked through Viator. Will was our guide and he made the trip exceptional. He was professional and his instructions were very clear. He knew where to go and how to interact with the stingrays, manatrays and moray eels. We were very impressed. He pointed out many interesting things living in the reefs. What I was really impressed about him was he was concerned about our safety and told us what to do and what no to do. I watched other tours around us and was shocked, the guides were allowing the people to jump off the boat while the propeller was in operation. Will ensured the engine was disengaged before we entered the water and told us where to swim for our safety. I would book a tour with him again. He gets 5+ stars! So so much fun! Our tour guide Tiba was hilarious and was an amazing guide. My family took a private snorkel trip with 'Will'. Can't say enough about how he made our trip. We first went to the coral reef that still looks untouched and reminded us of how a healthy reef should appear, and why we need to protect them for our children. We then visited the eagle ray family of 7 that traversed the southern tip. From there, we swam with the black reef tip sharks and sting rays with panoramic views of the eastern side of Bora Bora. Our final stop was to view the reef manta rays, majestic giants in the depth of the lagoon. Thank you to Will, for sharing marine life small and large, and reminding us of the beauty below.